Spacer beads are beads that are used to separate patterns on bracelets, necklaces or other beaded crafts. These beads are usually bigger or smaller (rarely the same size) than the beads they are dividing. Spacer beads are also thinner in side-width than the other beads used in the project. Furthermore, they generally come with their own designs or textures, and they are often incorporated into their own patterns with other beads. Like other beads, spacer beads were originally made from stone, shells, wood and even animal hooves and horns. As time went on and tools and technology became more advanced, beads were made out of metals and later plastics. Unlike the handmade beads of ancient times, most beads today are created by pouring hot metal or plastic into a mold. Once cool, they are then painted or decorated by another means. The true origins of spacer beads are unknown, but it is likely they first appeared on religious beaded works where each bead had its own meaning or significance. 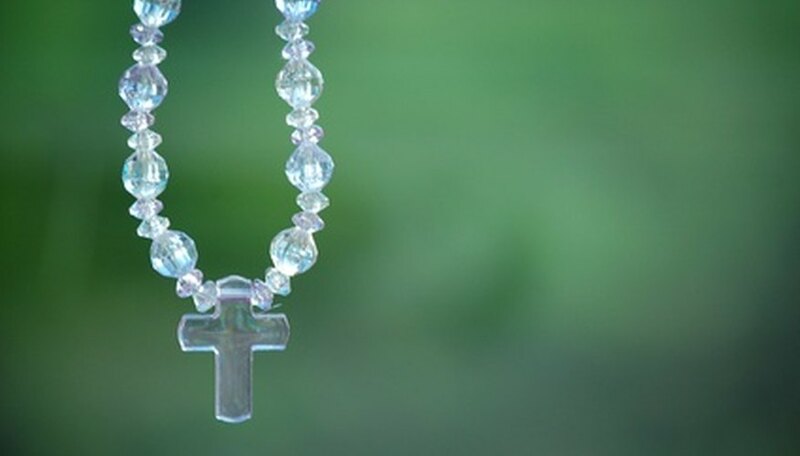 Today they can often be seen in many prayer beads; such as rosaries. Rondelle beads are often referred to as spacer beads (and sometimes vice-versa) because they are flatter and often larger in diameter than other beads. Their shape makes them highly suitable for spacing other beads on jewlery projects, and the are popular for children's crafts. Not all spacer beads are rondelles however, and rondelle beads are technically a type of faceted spacer bead that come in a variety of colors. Unlike some other types of spacer beads, they are most typically made from plastic. In addition to rondelles, there are many other kinds of spacer beads that do not fit the typical mold. Although more-traditional spacer beads are thin circles (thinner than regular rounded beads), there are hundreds that make thin shapes such as hearts or ovals with designs. These are more typically used with bracelets, however, largely because it is easier to have these beads lay flat against the wrist. Spacer beads can literally come in an infinite variety of designs. Ones made from metal usually have designs that focus more on texture, such as bumps or ridges. Celtic designs have seen a resurgence in popularity in more recent years, and many of these can also be found on the flatter spacer beads. Plastic beads, while cheapest, tend to have the simplest of textures and designs. Many plastic spacer beads such as the rondelle tend to be multi-faceted and more designed to catch light. Spacer beads of course are not essential to beaded works. For simpler looks, knots can be used to separate beads. Open chain links are also seen on many bracelets, necklaces and even prayer beads. However, works without spacer beads can take more time to create because the other beads will need to be secured by knots or other means if the maker does not want them sliding around. Brianna Gunter has been writing since 2007. She has bylines in both print and online media, including TheCelebrityCafe.com, Kiwibox.com, "The Robbinsville Advance" and "The Hamilton Post." Gunter has a B.A. in journalism and professional writing from the College of New Jersey, where she was also the editor-in-chief of the student newspaper, "The Signal."